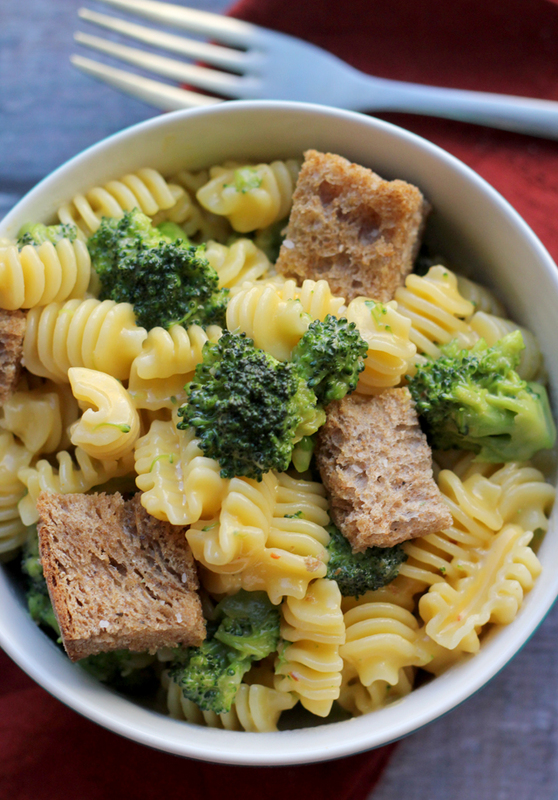 Mac and cheese gets hot hot hot in this buffalo cheddar mac and cheese with garlic croutons and broccoli. When MAC AND CHEESE MANIA WEEK just so happens to coincide with your birthday week? Basically the definition of kismet. Because we know that calories don’t count on your birthday week, and calories also don’t count on holidays (and what is MAC AND CHEESE MANIA WEEK if not a 120 hour holiday?). And the last time I checked, a minus minus a minus equals a minus. So the way I see it is that I’ll be BURNING calories this week by eating mac and cheese. So now you’re probably like what is MAC AND CHEESE MANIA WEEK and how can I get involved/justify eating carbs and cheese every day for a week straight. 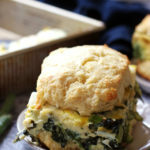 Well, it’s a blogger-made holiday hosted by Rachel and Brandy and sponsored by Door to Door Organics and OXO, that celebrates everyone’s favorite comfort food! A whole slew of fabulous bloggers (including yours truly) have come together to create every possible variety of mac and cheese that your hearts could desire. There will also be great prizes up for grabs, including Door to Door Organics Gift Cards, OXO Gift Baskets, Zak Designs Prize Pack, a year’s supply of Cabot cheese, a Vermont Creamery gift basket, a risotto kit from Marx Foods, Barilla Pasta, Anolon Advanced Bronze 4.5 Qt. Tapered Stockpot, Rachael Ray Stoneware Casseroval, Wusthof CLASSIC Studio Block Set, Microplane Graters and Kitchen Tools, a SavorX Starter Block with spices and Le Cordon Bleu by Swissmar oven to table roasters. Wow. That was a mouthful. Head on over to Rachel‘s and Brandy‘s blogs to find out more about how to win these fabulous items and to see what other great recipes have been cooked up for this fun event! But first, let’s discuss this mac and cheese and why you need it in your week. I stumbled across a spicy (no, but REALLY SPICY) buffalo sauce-infused cheddar cheese at Whole Foods last week (and it was on SALE, no less!) and just knew that I needed it in mac and cheese form with little bites of broccoli florets scattered throughout. For health. I was originally hellbent on making my own breadcrumbs for a breadcrumb crust until I got bitten by a lazy (post 11 mile run) bug and didn’t feel like breaking out my food processor. So croutons it was! These are extra special because they are tossed with a roasted garlic-infused olive oil, but if you don’t have such a thing hanging around your cabinets, regular olive oil will do! The resulting mac and cheese was MEGA creamy, MEGA cheesy, and BIG on spice. The.Boy and I sweated through every delicious bite. And went back for seconds. Because, birthday/holiday week negative calories. Gotta take advantage while we can. Toss bread cubes with garlic-infused olive oil. Spread out on a parchment-lined baking sheet. Sprinkle with salt and black pepper. Toast in the oven for 10-15 minutes, or until crispy on the outside. Bring a pot of salted water to a boil. Add pasta and cook until according to package instructions, adding in the broccoli florets during the last 2 minutes of cooking. Strain. Meanwhile, Bring 1 cup of milk to a simmer. Whisk together the remaining ½ cup milk and 2 tbsp flour. Pour into the simmering milk and whisk until warm and slightly thickened. Stir in the cheese, simmering until melted. Toss the cheese sauce with the pasta and broccoli. Serve topped with garlicky croutons. Spicy & cheesy? Sounds heavenly. This looks so good! And with all that broccoli it is definitely healthy. Happy birthday week! You have fun eating all the calories in the world. 😀 And I love that pasta shape. Fun! Buffalo cheddar cheese?!?!?!?! Ok yes. and obviously in this form! Yes to this. A thousand times yes. This will be my dinner tonight. 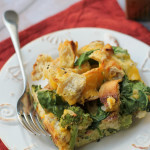 I’ve never heard of buffalo cheddar cheese – bet my boys would gobble this right up! This sounds amazing. I may have to make something cheesy myself now to overcome the cravings! Happy birthday week Joanne! I hope you have a great one! What a perfect, easy recipe! I’ve never heard of buffalo infused cheese. Gonna make it a mission to find it now. I always need a good excuse to go to Whole Foods, this is definitely one! Yummm! I bet the buffalo cheese works wonders here. 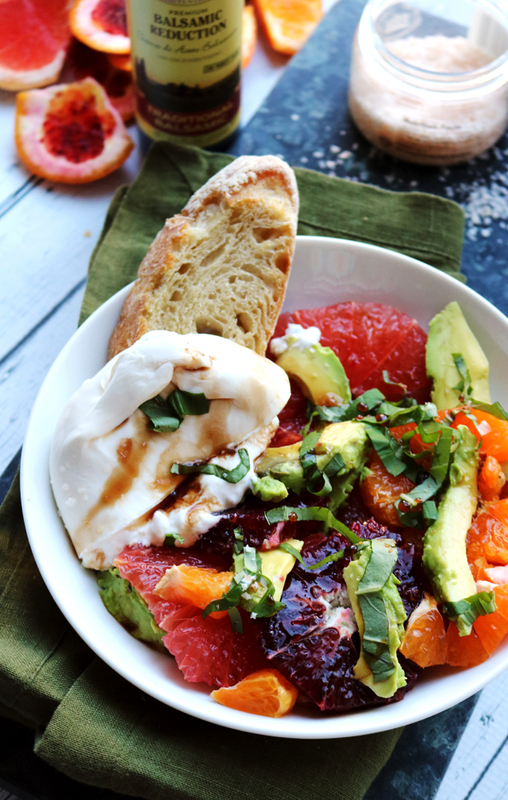 I can definitely make an Inspiralized version of this! First off, a big HAPPY BIRTHDAY to you! And I definitely think mac and cheese is an awesome way to celebrate (among other things, of course). Hope you have a wonderful bday week and that this is a wonderful year for you. Who doesn’t love mac and cheese? 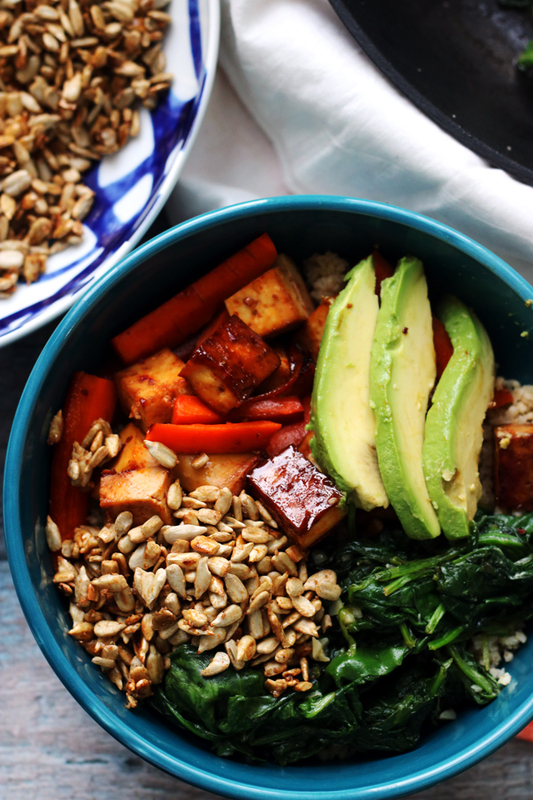 We Love the ingredients in this recipe! Have a wonderful Birthday too! Haaaaaaaaaappy birthday week!! I’m so excited for mac n cheese week, I can barely stand it! Those pasta noodles! 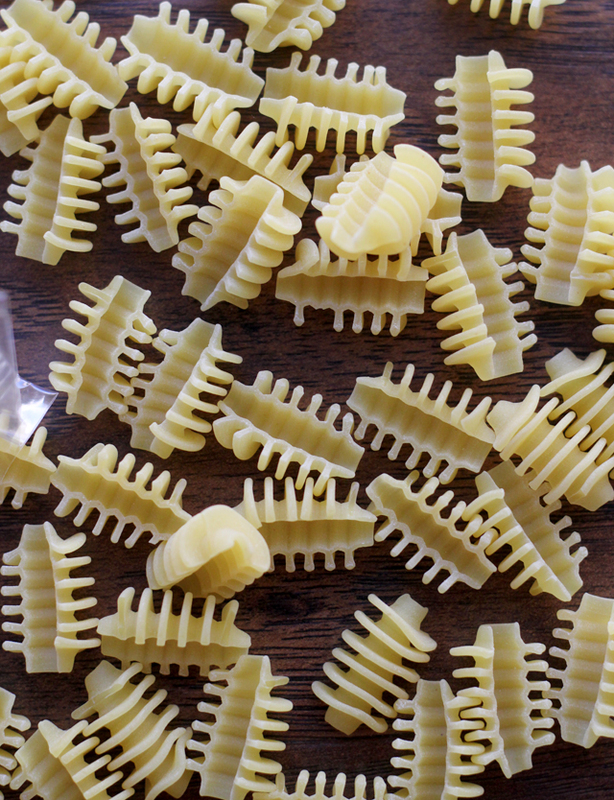 OMG, those pasta noodles! Never have I ever seen noodles like that and they look like they trap in so much cheesy goodness in their open-face glory. I’ve never tried buffalo mac and now it’s time to get my buffalo mac ON! The best week ever! I love that you kept the broccoli florets in it 🙂 What a fun idea! I’m stunned you didn’t put some squash in there – THAT would have made it the best birthday dinner! Also? I WANT ALL THE MAC AND CHEESE. Lol. Love yours! Buffalo cheddar deliciousness is what this is! … and the croutons! I die. I definitely need this mac and cheese in my life! It sounds/looks amazing! Happy Birthday Week! (Which is totally a legitimate thing.) I’d like this spicy mac and cheese on my birthday, especially with those crisp croutons. Enjoy this gorgeous cake and live it up on your birthday! Happy Birthday Joanne, mac n cheese is the perfect way to celebrate birthday week for sure and this looks awesome. Love the broccoli bits. That looks mega delicious! Love the add of garlic croutons. I love that you added some buffalo flair to your mac n cheese. I love a little heat and this sounds delicious. Hot-diggity-dog – happy Week-Long Birthday Celebrations Joanne! 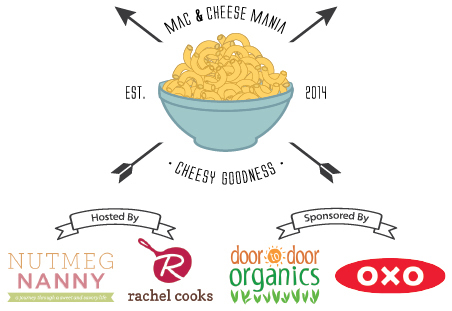 Mac n cheese is my daughters all time fav and she will love these week long mac n cheese fest! I can definitely handle a week long holiday that involves eating mac and cheese! Love the spiciness! This sounds so delicious! I have been on a Buffalo kick lately… I’m surprised at myself that I didn’t try to do a buffalo mac! Ha! Well you’ve done it for me. So now I’m off to the store to find that amazing cheese! Also, HAPPY BIRTHDAY! give me mac and cheese any time (even though I really shouldn’t eat all that cheese). I generally pass croutons by – pick them out of my salad, actually, but these look really good! Whole wheat, no? This is seriously my idea of heaven you know how much I love spicy foods! Dang kids are cramping my style 😉 I put broccoli in my M&C too! An 11 mile run justifies eating Mac and Cheese for an entire year. I need to get in on the celebrations! What a great way to celebrate your birthday week. It looks TASTY!!! We had mac and cheese the past 2 weeks. I’m either way out of the loop, or totally ahead of the game. I would NEVER call you lazy, Joanne! But the croutons were a great solution. 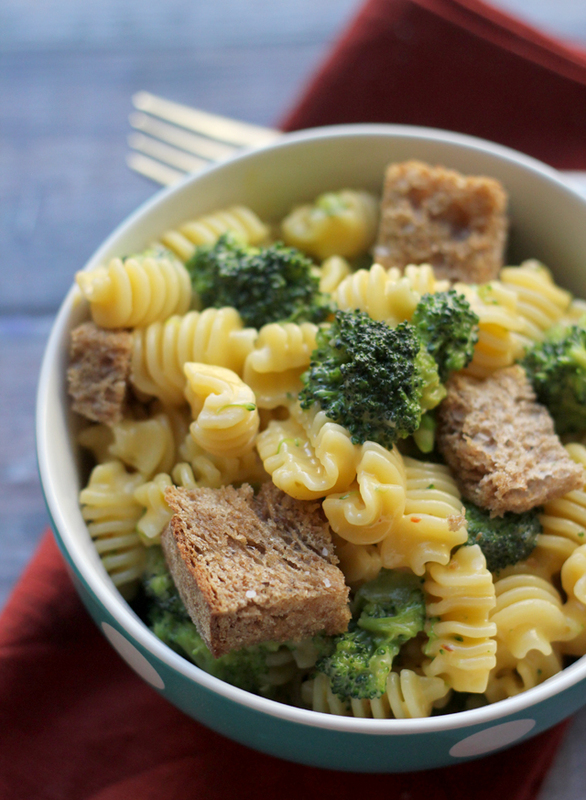 love the pasta shape, love the broccoli, love the flavors. very nice take on mac and cheese! I love buffalo flavored cheese! And I love mac and cheese more. What a great way to start your birthday week! Happy Birthday to you!! I hope it’s fantastic! That looks SO GOOD! 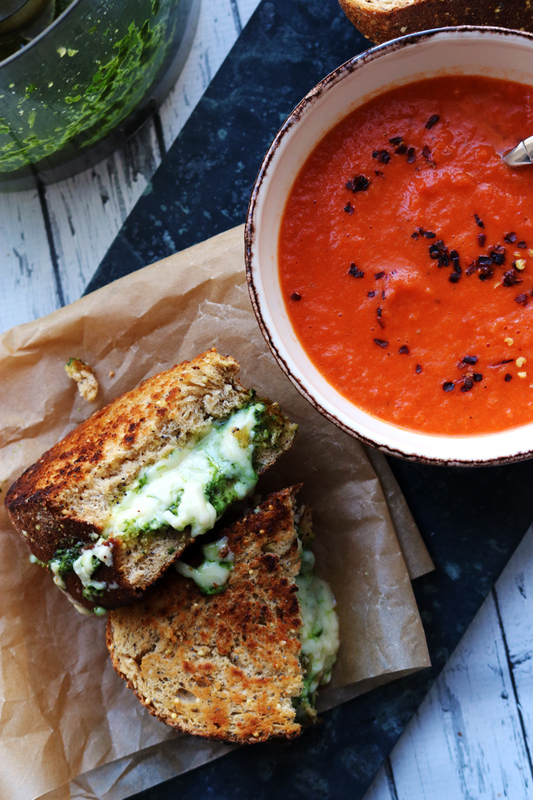 I might modify this and use some Cabot Bacon Cheddar I have lurking in my fridge. I would love to have this for lunch right about now. So delicious! mike would most definitely add hot sauce to this 🙂 what a great way to start celebrating your birthday week! BEST BIRTHDAY WEEK EVER! 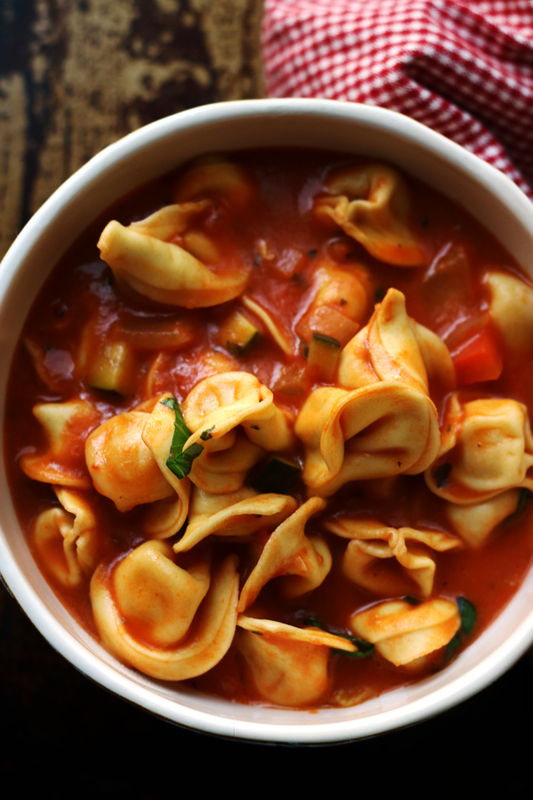 This reminds me of the velveeta broccoli mac we had as kids (yes, I was the weird kid who liked the broccoli one), except 1,000x classier and more flavorful! Happy Birthday! Buffalo mac and cheese is a fantastic idea. That kick of spice sounds like a great way to change things up. 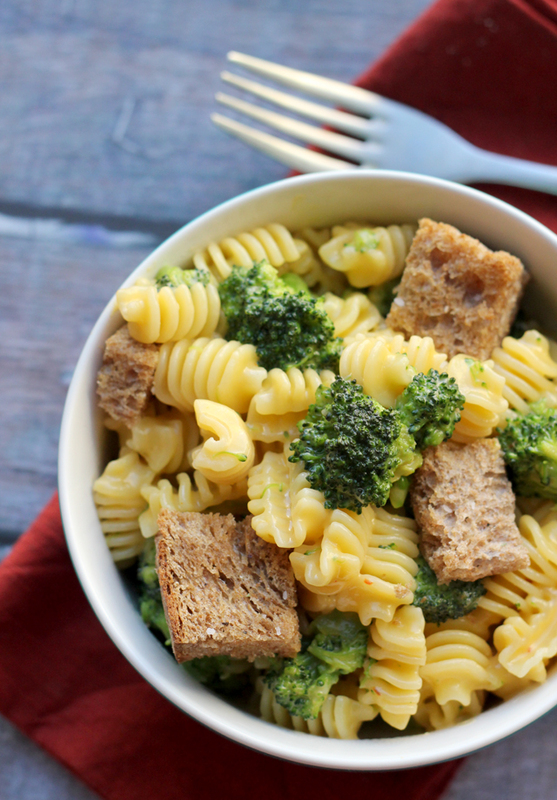 You cannot go wrong with broccoli and cheddar, why not put it in mac n’ cheese form? What a fun twist on Mac and Cheese! SO yummy – I’m all about anything buffalo chicken! This is such a fun link up! I love the added spice and the croutons. 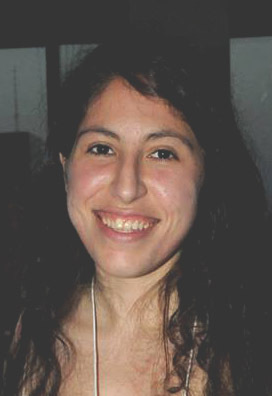 Well done, Joanne! Happy Birthday indeed! I need to find some of this cheddar, I have not seen buffalo cheddar before! what a fun recipe! looks amazing, joanne. Mac and cheese with CROUTONS?! I need like five bowls! Happy birthday week! I must try this! Buffalo cheddar? Yum yum..!! 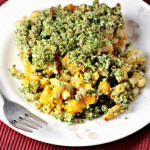 I could have this Mac and cheese dish any time, definitely a delish comfort food. 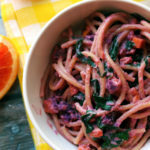 Love the look of that pasta! This is stunning, Joanne! I want it for diiiiiinner asap! Happy B-day week Joanne!!! Hope it’s wonderful! I’m so glad you posted the crouton recipe ’cause I have half a loaf of semi-stale multi-grain that needs to get used up. Do you have any idea what kind of pasta that is? I’ve never seen anything like it. 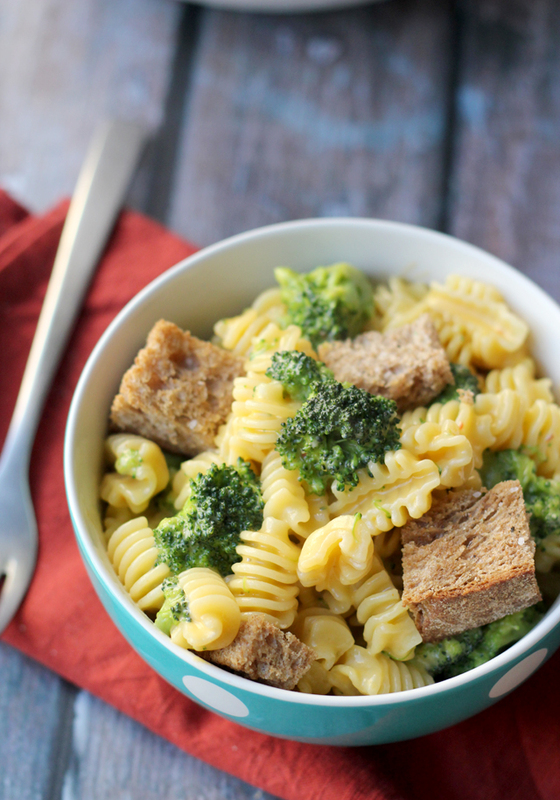 Love the idea of using broccoli with the mac and cheese. Again, Happiest of Birthdays sweetie! such a simple and great looking mac and cheese! Happy birthday, Joanne!! This looks amazing!!! Yes to anything buffalo! I love mac n cheese and this dish sounds like a winner to me! Happy Birthday week!! I hope it is a great one,. I could eat this mac and cheese. I like this, it not your everyday mac and cheese. I love the shape of this macaroni—helps to hold onto more cheese! Happy birthday Joanne and you couldn’t find a better way to celebrate than with this delicious pasta dish! Woohoo! I always love birthday week- I eat whatever I want and say well, of course I have to celebrate, it would be wrong not to. Cheese is always an amazing celebration and this mac and cheese is a great birthday-week-celebration-meal-starter. Woo, that’s a mouthful! I’m totally digging this mac n cheese. All my favourite things in one dish. You just inspired my love affair with buffalo-flavored-everything to continue! This sounds and looks crazy good! I have to get my hands on some of that cheese! A whole week of Mac and Cheese sounds like a great week to me! Happy Birthday! Croutons on mac and cheese!?! I love it!!! Thanks for helping us kick off mac and cheese mania with this amazing recipe! I feel this recipe was totally made for me. Buffalo cheddar cheese and delicious croutons….yes please! Also, I’m totally going to find that buffalo cheese. I need it in my life!